The latest scheme in London’s ongoing St James’s redevelopment is an eight-storey steel-framed office block which will help to further enhance the area’s business credentials. Steel tonnage: 600tSituated on Jermyn Street, the eight-storey 32 Duke Street St James’s forms part of the much wider St James’s redevelopment, a major 10-year investment programme that will revitalise the renowned central London area with a new public square, offices, retail outlets and high quality residences. The flagship project of this multi-million pound vision is the nearby St James’s Market scheme [see NSC January 2015], just south of Piccadilly Circus, that delivered 24,100m² of commercial and retail space across two eight-storey blocks situated between two of London’s most prestigious thoroughfares, Regent Street and Haymarket. No less prestigious, 32 Duke Street St James’s will provide 3,234m² of office accommodation, spread over six upper floors with two levels of retail offering 1,034m² of space. The building aims to achieve BREEAM ‘Outstanding’ for its commercial floors and BREEAM ‘Very Good’ for its retail zone, while the project as a whole, is targeting a WELL Building Gold Standard rating for its shell and core. The latter certification recognises the building has been designed as a healthy and productive space for its future occupants. 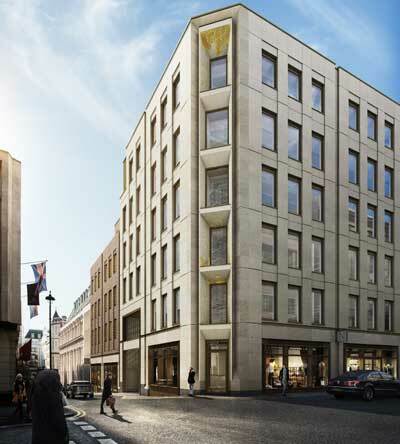 Occupying a footprint of 36m × 21m, 32 Duke Street St James’s replaces two old buildings that were demolished prior to main contractor Skanska starting on site. Inheriting a cleared plot, the initial construction task for Skanska was to deepen the existing single-level basement, to two levels, with the lowest floor [B2] housing the building’s plant equipment, bicycle storage and changing rooms. The building’s substructure is formed with concrete, and the main steel frame begins at basement level one. The only exception being two columns which are founded on the lowest slab to form the retail zone’s goods lift. A concrete core, situated alongside a party wall provides the main vertical stability, with beams up to 13m-long, forming a diaphragm and connecting it to the perimeter columns to provide column-free floorplates. Floor construction, above ground floor, is composite, with steel beams supporting 5,000m² of metal decking and a concrete topping. “Cellular beams have been used throughout the project, with service holes at regular intervals to give maximum flexibility to future occupiers in terms of service distribution,” says Bourne Steel Project Manager Stephane Dubois. 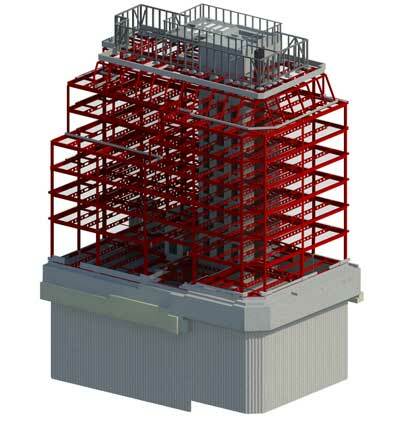 The use of cellular beams and their ability to accommodate services within their depth was one of the reasons for choosing a steel-framed solution for this project. “We looked at other framing materials, but steelwork offered the most economical solution as we were able to keep the integrated structural void and services zone within the beam depths and thereby build the required number of floors within a 37m-high structure,” says Waterman Structures Director Richard Whitehead. 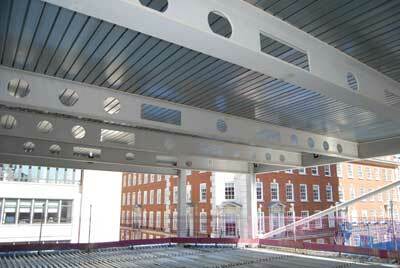 Maximising the available space also had a bearing on the choice of column members used on this scheme. The majority of perimeter columns at 32 Duke Street St James’s are solid billets, as opposed to the more traditional I-sections. Billlets generally have smaller dimensions, 350mm × 125mm for this project, and consequently they intrude less into the building’s useable space than one would expect from other steel sections. “Billets are also flat to the façade, giving a more aesthetically-pleasing and neater interior finish,” adds Mr Whitehead. 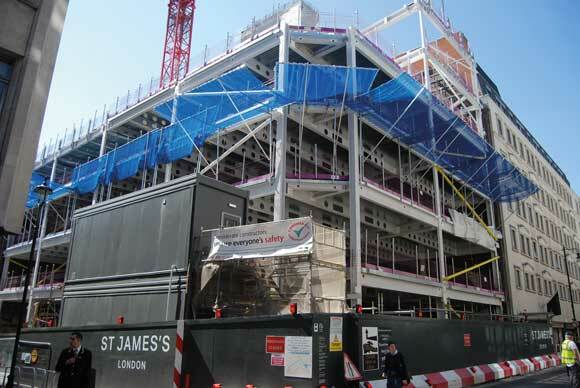 In keeping with the steelwork’s aesthetic theme, many of the column splice connections were designed to be within the floor depth, in order to hide them from view as many areas of the steel frame will remain exposed in the completed building. The majority of the steel frame’s connections are via fin plates. However, due to the large loads at many locations on the upper floors where the floorplates step back, Bourne Steel also had to design more complex stub connections. The building steps back at level four to create an outdoor terrace and then again at level six where the façade incorporates a mansard formed with raking columns. 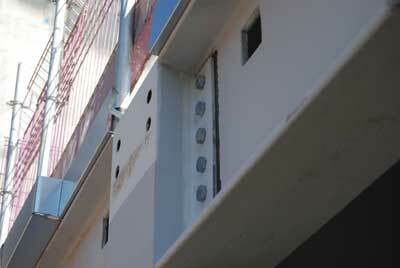 In these areas, transfer beams have been installed to support the irregular column lines. On the exterior, the building is clad with a concrete panel system which has required numerous connections around the steel frame’s perimeter. The panels, which weigh up to 18t each, sit flush to the steelwork and necessitated flat bolted connections for the exterior steel splices. All of the project’s lifting duties are being carried out by the site’s tower crane. “This is a typical inner city site with no space for materials storage and so we had between two and four steel deliveries every week, which were immediately erected,” explains Skanska Senior Engineer Nauman Soomro. Bourne Steel completed the main steel frame in June, but has been scheduled to return later this year to infill the gap left once the centrally-positioned tower crane is removed. 32 Duke Street St James’s is due to be completed in Spring 2019.